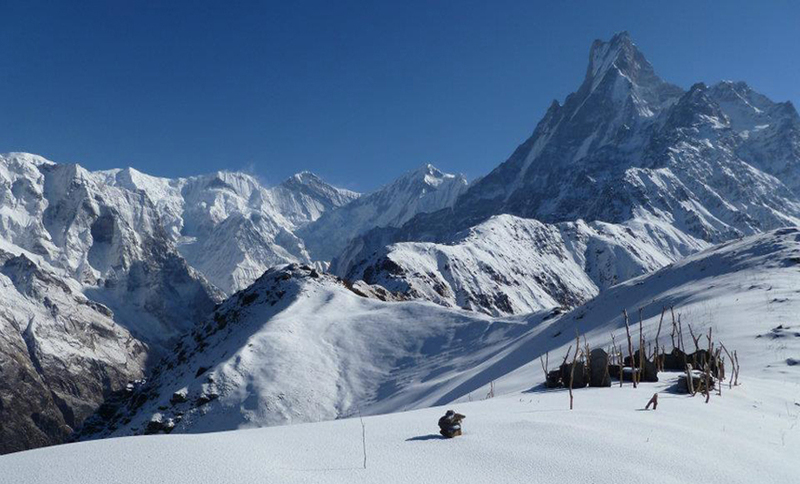 Mardi Himal Trek is a recently opened route in the eastern part of the Annapurna Region. Mardi Himal is about 5200m high from sea level and less than 15 miles north of Pokhara. 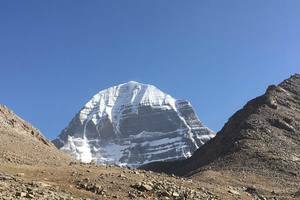 It is as short and easy trek just over a week long and perfect to get away from crowded treks as this route is still unspoiled. Here one can experience the real local culture along with great Himalayan scenery of Annapurna, Dhaulagiri, Machhapuchhre (Fishtail), Hiuchuli and Manaslu ranges. 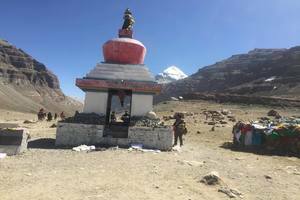 It is the hidden gem of Annapurna region with peaceful route as very few make their way to Mardi Himal’s Base Camp which is situated at the base of Mardi Himal and the beautiful Machhapuchhre. First you have to reach Pokhara via flight or drive from Kathmandu. From Pokhara we drive to Kande where the Mardi Himal trek begins. The trekking trail goes throughout the villages and mostly inside lush green forests of oak, maple and rhododendron. We go through Pothana, Pitam Deurali and reach Forest camp – called Kokar among local people. 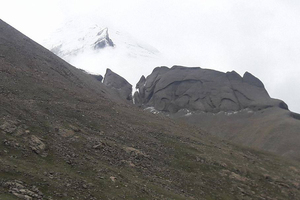 Then we trek to Low camp with steeper path at the beginning which changes to gradual climbing after a while. As we climb higher to High camp forest begins to decline with more grasslands and occasional rhododendron trees with stunning views of close Himalayas in front of us. 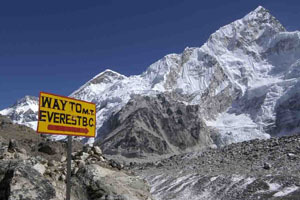 High camp offers stunning close up view of entire Annapurna Range. We can also hike to upper view point with few steep sections. The sunrise over the Himalayas from this view point is simply breathtaking. People bring yaks and sheeps during summer in this area. After enjoying the stunning views of mountains we retrace back to Forest Camp and trek to Jhinu Hot spring via Landruk. Then we descend to Nayapul where transportation will take us to Pokhara and back to Kathmandu. One can also enjoy the beauty of flora and fauna along amazing land scopes. 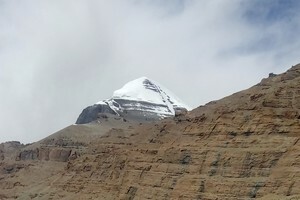 This mountain adventure connects with friendly local people and offers home stay along the trek. Since it is a new trekking route trekkers have to go with the way locals live and eat. You can’t expect a fancy lodge and food but only pure rural lifestyle and culture. You will be pleased with warm hospitality and friendly behavior of local people. Day 03: Drive Kathmandu to Pokhara (7 hours). O/n at Hotel in Pokhara. Day 04: Drive Pokhara to Hyenja and trek to Gyachok. O/n at Camp. Day 05: Gyachok trek to Sano Khoban (1600m). O/n at Camp. Day 06: Sano Khoban trek to Pipa (3150m). O/n at Camp. Day 07: Rest day for Acclimatization.O/n at Camp. Day 08: Pipa trek to Thulo Kharka (4120m). O/n at Camp. Day 09: Thulo Kharka trek to Base camp (4100m). O/n at Camp. 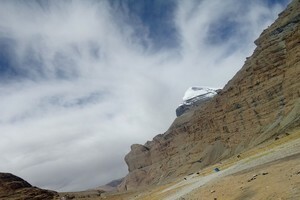 Day 10: Base camp trek to Korchon (3680m) . O/n at Camp. Day 11: Korchon trek to Riban (1780m). O/n at Camp. Day 12: Riban trek to Hyenja and drive to Pokhara. O/n in hotel at Pokhara. Day 13: Drive Pokhara to Kathmandu. O/N at hotel in Kathmandu. Day 14: Free day. O/N at hotel in Kathmandu.